Highmountain tauren and Drogbar artifacts. The drogbar (pronounced "DRAWG-bawr") are a shamanistic humanoid species that dwell in the infinite caverns deep within Highmountain on the Broken Isles. Their brutish appearance can hide their cleverness. Having once been the slaves of Deathwing himself, the drogbar have long lived in relative peace with the Highmountain tauren, but shortly after the Burning Legion's return the drogbar leader, Dargrul, stole the ancient [Hammer of Khaz'goroth], initiating a war between the two races. Xal'atath implies that the drogbar are failed titan creations. The drogbar were once slaves to the black Dragon Aspect himself, Neltharion the Earth-Warder, and they were the ones who placed the goblin-forged adamantium plates on the Aspect when his body began to fall apart. Neltharion also had the drogbar experiment with ways to merge the elements into a binding ore. He believed it would be the ultimate tool in his rise to power. There were at least fifty attempts. One revolt occurred before the arrival of Huln Highmountain but was swiftly ended by Neltharion. The revolt's leader, The Grey One, was petrified into a statue as a constant reminder of who the drogbar truly serve. When Huln finally arrived and used the [Hammer of Khaz'goroth] to banish Neltharion from the region, the drogbar were freed. The Rivermane tribe were the ones to first establish a fragile peace pact between the tauren and the drogbar as a means to survive in relative peace. As part of this agreement, they mutually benefit from one another's resources through trade at designated areas outside drogbar caves. The drogbar provide spell components from inedible plants, rare minerals, gems, potent alchemy and other rarities as a trade offering to the tauren, and in return, the tauren bring the drogbar grain, fish, leather goods, and lumber. They make a mutual exchange at these ritual sites, then go back to their respective homelands. It's a symbiotic relationship — they don't like each other, but they need each other. The drogbar at one point warred against the followers of the vrykul warlord Volund. However, soon after the Burning Legion's arrival, a drogbar leader named Dargrul the Underking destroyed the unity of the two races and stole the [Hammer of Khaz'goroth], a powerful artifact protected by the Highmountain tauren. Using the terrible power of the Hammer, the Underking intends to take control of Highmountain. Not all drogbar work for Dargrul, however. The Stonedark tribe led by Navarrogg, in gratitude to an adventurer who saved them from the Bloodtotem tauren, joined the Highmountain Tribe instead. There is also at least one group of neutral drogbar that had a settlement in what is now known as the Feltotem Caverns, but after the Bloodtotem became the Feltotem, these drogbar were pushed out by concerted demon and Feltotem attacks. Their current location is unknown. Drogbar that are part of the Twilight's Hammer can be found in Highmountain's Deep Roads. Another Old God-affiliated group of drogbar is the Necrodark. Drogbar are not violent by nature, despite their size. Living in caves, the drogbar make the most of what they have. At least one particular species of mushroom is known to be gathered and prepared for consumption. Rock is used for furniture; tables are an obvious application, while "resting stones" are chairs, and long, rectangular slabs are "sleeping stones". Stones that make different sounds when struck can used for drums, such as "tink rocks", "bop rocks" and "clomp rocks". With their powers over the earth, the drogbar know how to carve stone into containers such as cups and shallow bowls, to ones with lids. With a channel carved around the outside for a leather strap, lidded containers can be small ones with a plug of wood, to large, stout ones with a matching stone lid fitted into the top. Entire waterwheels made of stone are used as a power source for simple engineering, fed by subterranean waterways that flow into the caves. Stone conduits suspended from sturdy wooden supports embedded in the walls also partially redirect subterranean water for the peoples' convenient use. Many of these items are most likely crafted by drogbar Stoneshapers, who are also known to calcify the dead bodies of important drogbar to be commemorated as statues. While most drogbar appreciate the rough edges of a raw gemstone, others prefer a smoother, rounder jewel. Rather than using standard gemcutting tools, they use a hand-cranked stone device, which tumbles the gems over the course of several weeks. These are typically operated by servants, slaves, or disobedient youngsters. For some, snail racing (including a racing circuit) is a popular pastime. Snails are also used as a culinary ingredient at least by the Stonedark (whether they are the same species as the ones used for racing is unknown). There are rumors that the ancient drogbar collected powder from the residue of dragon's breath. The Basilisk Bazaar is an event held by the drogbar where they trade, fight and skin their lizard pets. The drogbar have a mastery of the earth and creatures that dwell within it. Jale Rivermane believes that they began learning strong magic after the theft of the [Hammer of Khaz'goroth]. The drogbar have a close kinship with Highmountain's giant worms. They use caves such as the Rockcrawler Chasm to train and breed fledgling rockcrawlers that in time grow in size and strength, morphing into monstrous siege worms that the drogbar ride into battle. The drogbar feed their fledgling worms eagle eggs so they'll grow strong enough to serve as mounts. An enormous worm called Naraxas, mother of monsters, has been worshipped by the drogbar since the age of Neltharion. Constant sacrifices are made to the creature so she can nurture the generations of horror the drogbar use against their enemies. During the battle of Snowblind Mesa, the drogbar used spawn of Naraxas to burrow their way to the surface and deploy their troops. The great worm Jorhuttam is worshipped by the Frostcrag tribe of drogbar. Not much is known about the drogbar language. One of the more common terms is "brul", apparently an honorific. The drogbar language shares one term with Draconic. Drogbar seem to be inspired by Dungeons & Dragons's bugbears. 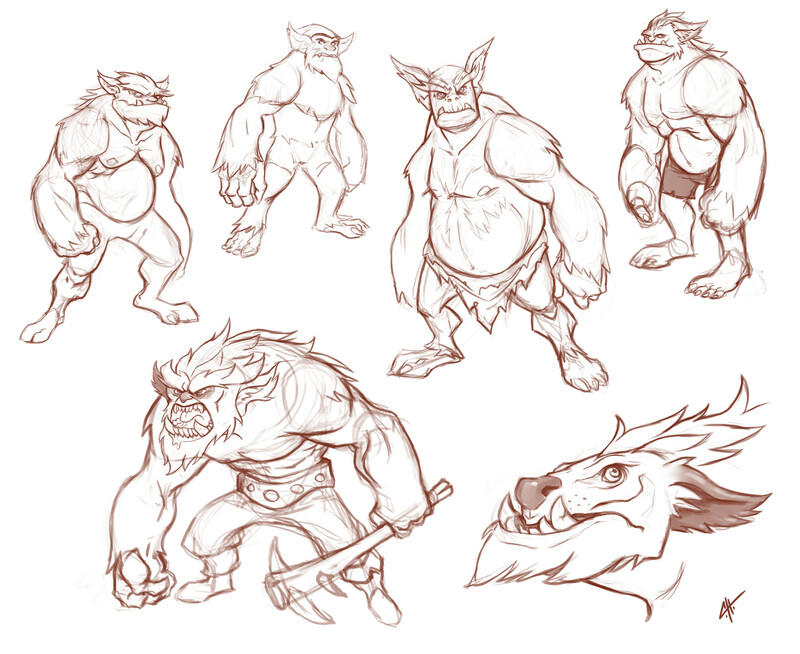 Early drogbar concept art depicted them as bear-like creatures, before evolving into something more akin to D&D's bugbears, and some drogbar image files are labeled as "bugbears". Drogbar use the same model skeleton and animations as post-5.2 dire trolls and Warlords of Draenor dire orcs. Considering the Twilight's Hammer have access to subterranean tunnels under the Great Sea, it is possible that the cult met the drogbar of Highmountain that way and enrolled some of them. Since Xal'atath has implied that the drogbar are a failed titan experiment, they could have evolved from the troggs. In the canceled Warcraft Adventures, Deathwing was served by trolls which had mottled and grey skin, a description that might have inspired the existence of the drogbar. One quest might've called them "rock trolls". A drogbar in the Legion announcement trailer. Early drogbar concept art by Mark Abadier. Concept art by Christopher Hayes. Concept art by Cole Eastburn. Drogbar fighting Highmountain tauren outside Thunder Totem in A Mountain Divided. ^ Xal'atath whispers: More of the titans' failed experiments grow here unchecked. The drogbar prove their failure as creators.